Discussion in 'Games and Competitions' started by Saffron, Nov 11, 2008. Please pick your favourite picture!! Here’s where I get to show off your marvellous creations for Stage 2, and the rest of the forumites get to vote on their favourite picture. Forumites are asked to vote on their favourite picture. Once the outright ‘best picture’ is determined, I will put up a second poll (Poll B) – which will contain all the pictures except the one(s) that were voted best in Poll A. This poll will be open for 3 days and will be a multiple choice poll. Poll B is optional – it gives the opportunity to offer additional points to those entrants where you found it hard to choose between the pictures for the outright winner. Each entrant for Poll B will be allocated the percentage of 10 that equals the percentage of votes their picture receives in Poll B, rounded up or down according to conventional rounding rules. 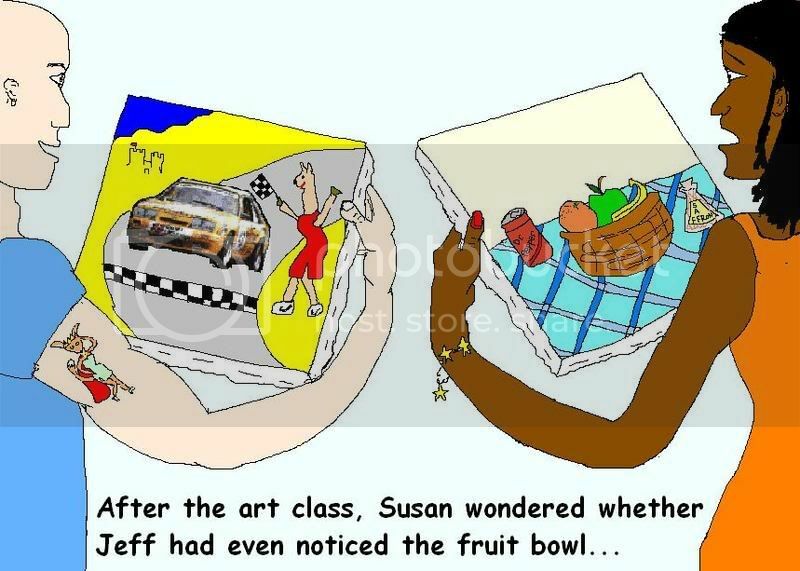 The apple and orange are in the fruit bowl, the saffron and Dr. Pepper are next to the fruit bowl, and 'Susan' is wearing a star bracelet. 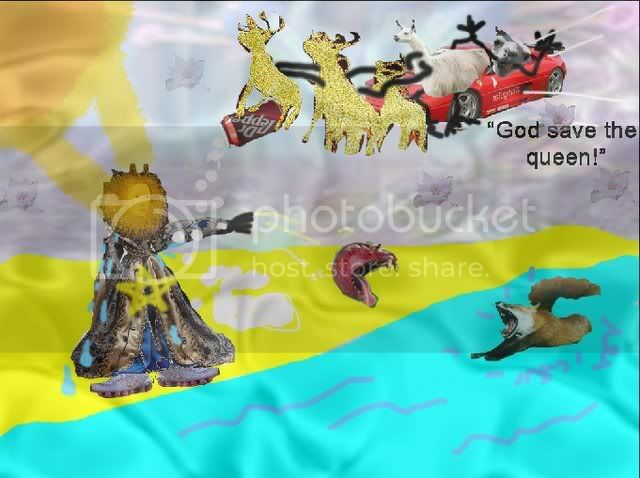 The racecar, the llama and the sand are on 'Jeff's' painting, and the llama is wearing Nikes. The fox is tattooed onto Jeff's arm, and she's wearing a crown and a red cloak, making her a queen. Both her and Jeff's painting are his fantasy. 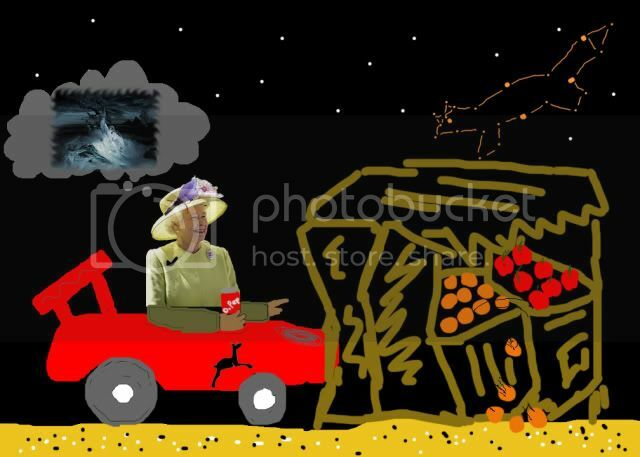 The QUEEN, wearing NIKE branded clothing, with a SAFFRON flower on her hat, drank some DR PEPPER whilst driving her RACECAR at night on the SANDY beach. This caused her to have a FANTASY and she crashed into a market stall spilling the APPLES and ORANGES. The car’s decal shows a LLAMA, and the background night sky has STARS, with one of the constellations forming the shape of a FOX. 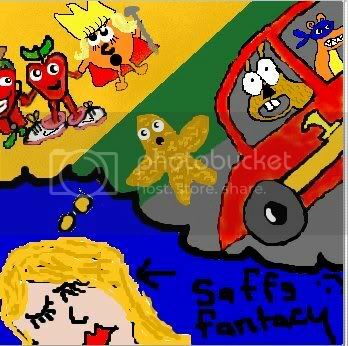 SAFFRON is having a FANTASY about a beach car race. The LLAMA and the FOX are in the RACECAR whilst the surprised looking STAR is cheering them on. 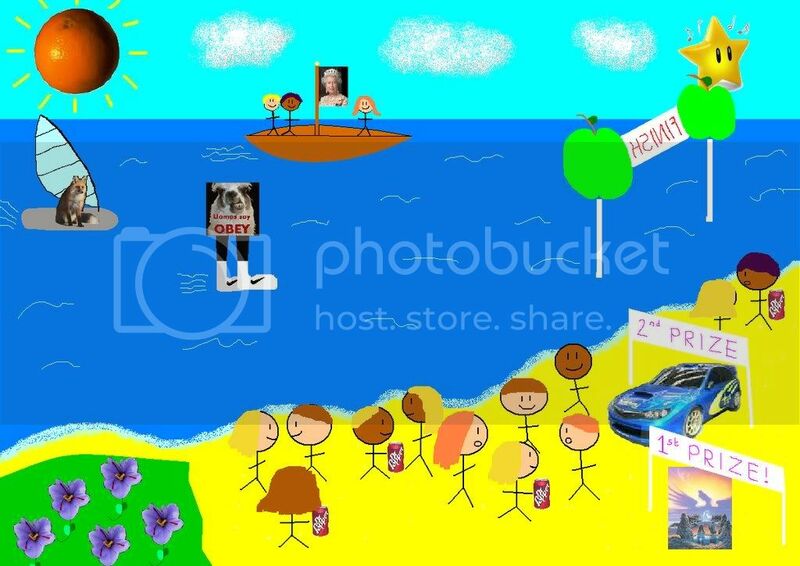 The spectators standing on the SAND watching the race are the ORANGE QUEEN, the APPLE wearing NIKES, and DR PEPPER. 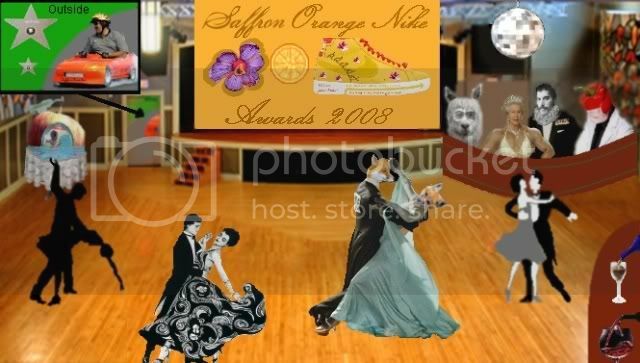 The Saffron Orange Nike Awards 2008 are underway. This is the dancing contest where the Foxes are doing the foxtrot, whilst the judges – the Dalai (L)lama, the Queen, and Dr Pepper look on. In the bottom left corner is the bar where refreshments are available – the two options are sand in a wine glass, or red wine with a man diving into it (what a fantasy!). Someone has left their baby in the bassinette over in the left corner (use of the baby in the apple pic) whilst out through the exit door, we see the racecar on the road with the star plaques on the grass. 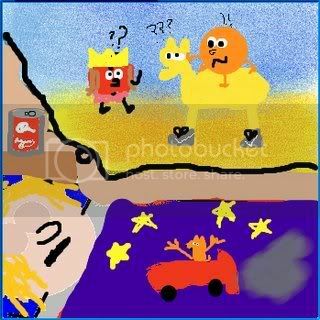 Could that be Thelma the ORANGE FOX and Louise the LLAMA escaping in their RACECAR with a stash of NIKES in the back and a trailer full of SAND whilst the STARs shine in the night sky? 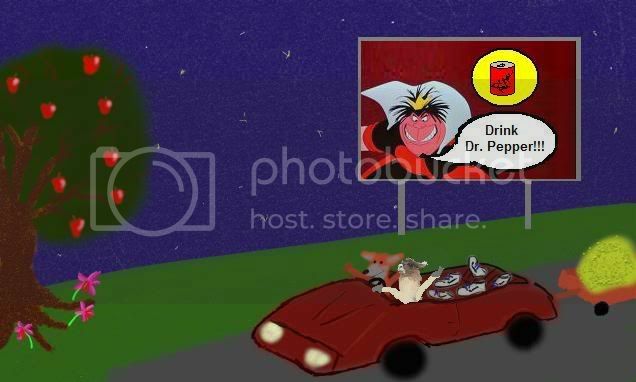 They are passing a billboard with the QUEEN advertising DR PEPPER, an APPLE tree with SAFFRON flowers growing at its base. The whole idea of a fox driving a car is a FANTASY. A race is going on – the competitors are a FOX, a LLAMA wearing NIKES, and a sailboat with the QUEEN on its sail. 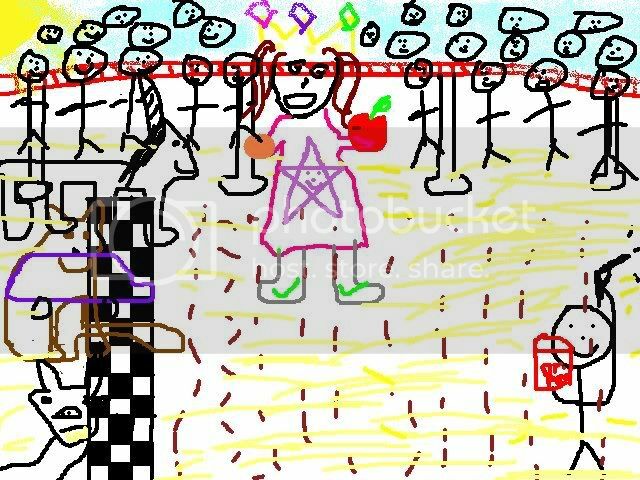 The ORANGE sun is shining, and APPLES on poles hold the finish line banner, whilst the STAR announcer is ready to determine the winner. First Prize is a FANTASY, second is a RACECAR, and the people watching on the SAND are drinking DR PEPPER next to a grassy dune with SAFFRON growing on it. The Queen is being doused with Dr Pepper by the llamas pulling the racecar sleigh! She is throwing an apple into the sea from her sandy haven to distract the sea fox that is attacking her! She is wearing Nikes, and has a star pendant on, whilst the orange sun beats down on her relentlessly. You can see the saffron flowers in the background of this fantasy picture. The flying pig (an animal which is still unfortunately in the realm of fantasy, even if it is held up in the air though use of an orange propeller) is a 5-star bar whose speciality drinks are Dr.Pepper and liquid saffron. The entrance to the bar is marked by the tree lady wearing a dress of apples and a necklace shaped like Nike's logo. 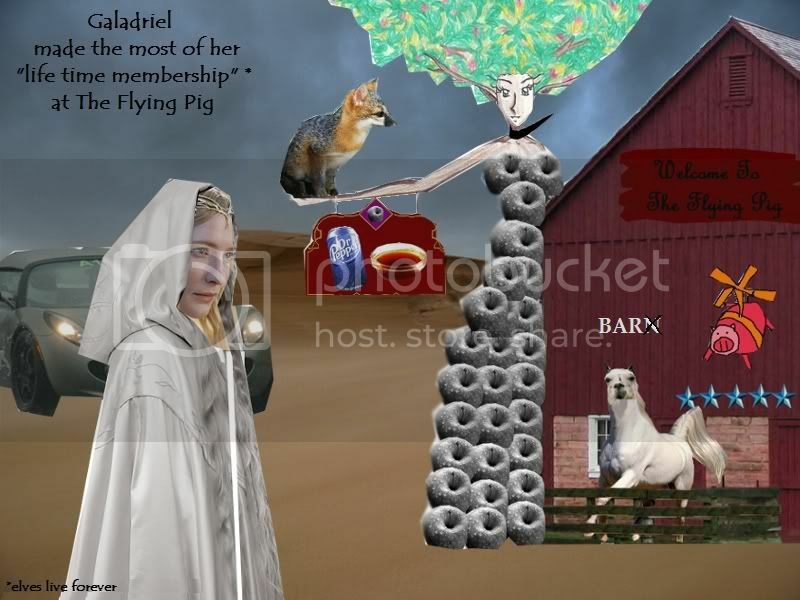 There is a fox perched on her limb who wants to go into the bar - which used to be a barn, hence the presence of the llorse (llama head on horse body) - but can't as unflying animals are not allowed entry. Galadriel is Queen of Elves and loves her "lifetime membership" at The Flying Pig where all sorts of strange and wonderful things happen, and her vehicle is not so much a racecar, but a car she races to the pub. Naturally, this all takes place on a sandy desert. 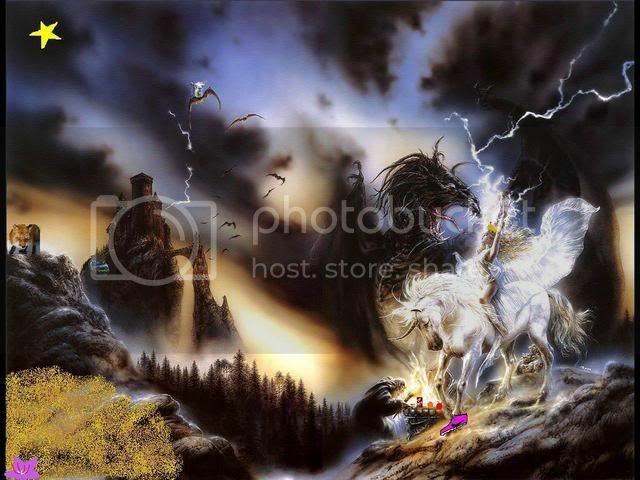 Here we see FANTASY picture of a guy giving an offering of an APPLE, an ORANGE and a DR PEPPER to a QUEEN riding a unicorn who is wearing a NIKE. In the distance we can see a RACECAR driving down the side of a mountain and overhead there is a flying LLAMA thing. To the left there is a FOX on top of another hill which has SAND at the bottom of it and SAFFRON growing in the sand. And there is a nice bright STAR shining in the sky! 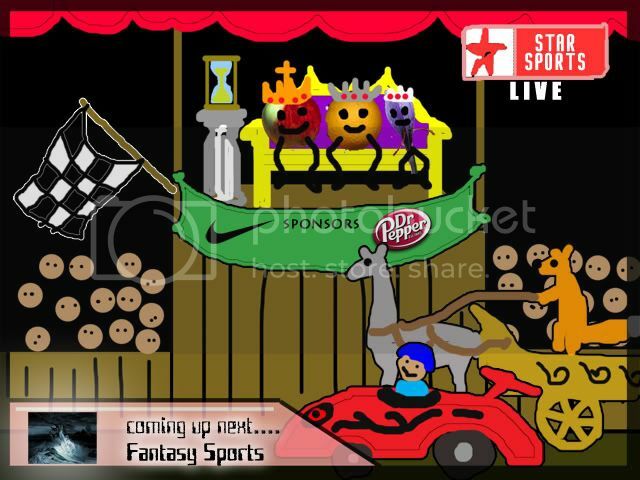 This is a BP showing a race... between a llama , fox , racecar and a unicorn (fantasy). Queen is standing in the middle on the sand... I wonder why? Wearing a dress with a star on it. A man ready 2 pull the trigger, with Dr Pepper in his hand. And there's sand with saffron strewn all over it... Queen has apple and orange in hand. Queen wearing Nikes . 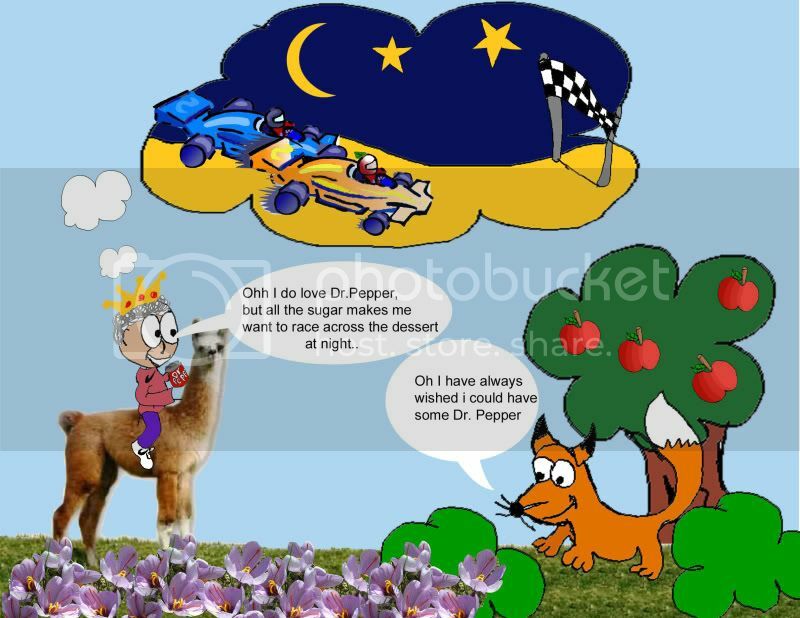 The QUEEN, drinking DR PEPPER and wearing NIKES and riding on a LLAMA is having a FANTASY about racing across the desert SAND in her ORANGE RACECAR, at night, with the STARs shining. She is talking to a FOX in front of an APPLE tree with SAFFRON flowers in the foreground. Can we vote for our own? Having said that, they are all really good.